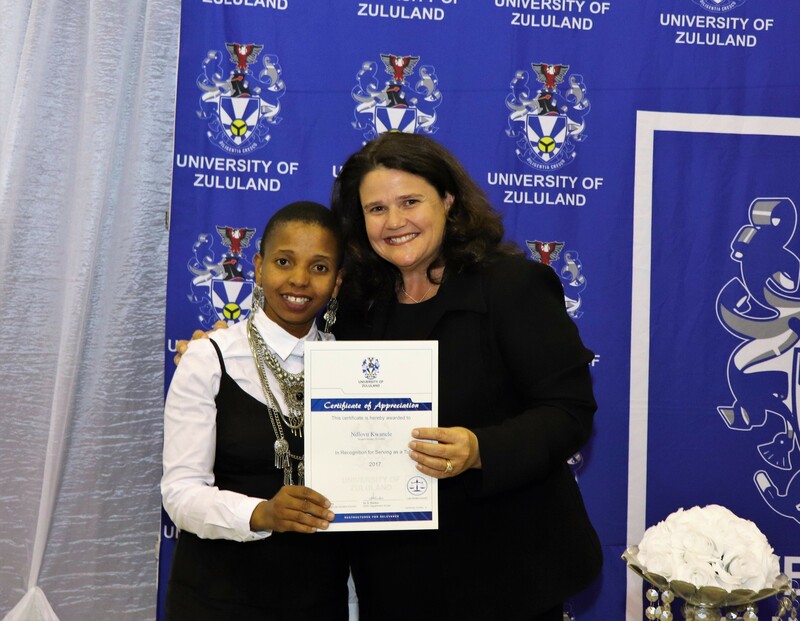 The University of Zululand’s (UNIZULU’s) Department of Law recently held its prestigious gala dinner at the Richards Bay campus. This gala dinner provided a perfect opportunity for alumni, academics and students to interact in a picturesque setting. Among those honoured at the event were the newly elected SRC President Nontobeko Zulu, Top Achiever Awardee Ms Kwanele Ndlovu, Alumnus Advocate Sifiso Ngcamu as well as the Head of the Department Dr Kanagie Naidoo. The dinner provided the students an opportunity to share their experiences of studying law. SRC President Zulu alliterated strong remarks of her personal experience citing her pride of being from the class of 2018. “What I like the most about this class is that wherever we are, we always leave a mark. We are diverse, intellects and who are supportive towards each other. Some of us are involved in politics some, of us are strong in academics some of us lead societies. We live up to a slogan which says that lawyers are destined to lead.” She concluded by saying that as they go into the work place they must lend a helping hand. Dr Kanagie Naidoo paid tribute to all the final year students emphasizing that lawyers are destined to lead and commended the Department of Law’s continued commitment to excellence. “As your journey as a student nears its end and you approach the dawn of a new journey into the law profession, the department wishes you well. May you have every success. Remember to be the best you can be and fly the flag of UNIZULU high. Lawyers are leaders so lead with integrity and a high level of professional ethics.” She added by thanking her students for all their hard work.